Victory was outside the chip shop. England were on the other side of the road. They could see the chips being served. They could smell the chips being fried. But the road was busy. And besides, they had no money anyway. What can England learn from today? Well it's not the lack of runs that's the problem. It's the bowling attack. 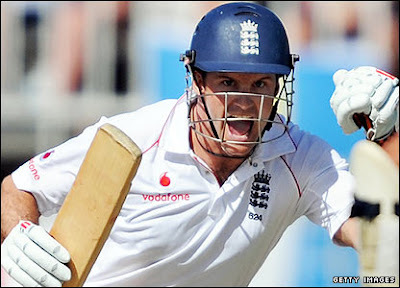 Besides Flintoff being injured (again, again, again, again), England lacked a bowler that could cause havoc. Maybe England were a bit unlucky today. Maybe the West Indies were granted a bit of luck being offered the light (and taking it, quite rightly). What remains is that, minus the pitch which wasn't the greatest (not surprising really, given that it was a football field six days ago), England must (must x100) improve if they are to stand any chance this summer. Nightwatchgirl is off for some chips because she has money and she can cross the road. NWG would like to spend just a few moments talking about the previously considered not so brave man - Steve Harmison. Turns out he is quite brave. For NWG saw with her own eyes (admittedly on the television, but still - that never lies, does it? ), poor Harmison retching, sitting, eyes shut, drinking, sitting again, a bit more drinking and then slump off once the West Indies team were all out. Apparently he is suffering from a stomach bug. Coping with boiling temperatures when you don't feel well is bad enough. Coping with boiling temperatures when you're meant to be participating in a competitive cricket game is quite another. NWG hopes he is feeling better today and has enjoyed sitting quietly. Because later, regardless of how sick he feels, he's got to play a big part in getting the West Indies team out so England can even up the score. Just no one mention the word 'carrot' to him.